“Salvator Mundi,” a Priceless Leonardo, or a Fake? In early November when I opened Paul’s envelope containing an L.A. Times article entitled “The Lost Leonardo,” I looked at the stunning color photo of “Salvator Mundi” and felt thoroughly confused. It immediately struck me as being both an authentic Leonardo, and NOT a Leonardo. The masterpiece was shown at The National Gallery in London from Nov 9, 2011 to Feb 5, 2012 as part of their exhibition, “Leonardo da Vinci: Painter at the Court of Milan.” This beautiful portrait of Christ as “Savior of the World,” depicts His face softened by the master’s famous sfumato dry-brushing technique. However, the drapery, embroidery, right hand raised in benediction and left hand holding a crystal orb representing the world, are painted in clear detail. The face is so hazy as to seem like a vision or an image in a dream. Many art historians and experts question the origin of the painting. Its source is the subject of significant controversy. I request indulgence to add my ideas to the debate. The eyes are not exactly at the same level and each eye has a subtly different gaze. As you face the painting, the eye on the right is lower and looking down somewhat at the viewer’s mouth, by comparison with the other eye which is higher and gazing directly out into the eyes of the viewer. Leonardo never had this kind of trouble focusing the gaze of his faces. One hand is actually somewhat crude — the hand holding the orb. The thumb is especially rigid and wooden. The raised hand is much better and looks like Leonardo’s work, while the hand holding the orb does not. The orb is not well-defined. It is hard for me to imagine that Leonardo would not have developed more highlighting and definition in such an important part of the painting. Although the sfumato technique is very typical of Leonardo’s work, it is overdone here, as if a struggling younger artist is attempting to camouflage some problems, especially in the eyes, which are nearly dry-brushed out of existence. Many parts of the face, the chest, and the ringlets of hair at both sides of the chest, feel very much like other paintings by the master. The mouth is quite reminiscent of Leonardo, and that’s where I looked first, because the corners of Leonardo’s mouths are especially distinctive. This painting has such a corner on the side near the raised hand, but not the other. I just have to observe that while this mouth is very beautiful, only half of it is a Leonardo mouth. The hand raised in blessing is utterly characteristic of Leonardo – organic and alive with flesh and bones. But the execution of the orb-holding hand is surprisingly immature and wooden. Finally, stepping back and taking in the overall effect of the painting, it feels both overly dramatic and too rigid for a Leonardo to me, and I still have the feeling that it was largely executed by one of his apprentices under the guidance of Leonardo. It feels like a painting made by a younger artist than the others we know are from the master’s hand. This beautiful image is extremely dramatic in its ghostly quality on a dark background, and especially in the gauzy quality of the not quite matching eyes. And yet the lower half of the painting — the drape and ornate border ribbons are so rigidly and meticulously rendered as to seem like they might belong to a different painting altogether. The more I look at this work, the more I see the marks of two artists — the master’s hand is in part of the face and the raised hand. The apprentice is more and more obvious in the rest of the painting. The left eye is perfect and expertly formed and gazes straight into the eyes of the observer, while the right eye is badly formed and lower than the left eye, and gazes at the observer’s mouth. The left eyebrow is nuanced and very Leonardo-like, suggesting the contours of the brow behind it, while the right eyebrow is an uncompromising arc lacking in such subtleties. The line connecting the bridge of the nose to the eyebrow on the left is a diagonal line, again showing an understanding of anatomy, while the same line on the right is a rigid vertical line. The left mouth corner exhibits the distinctive Leonardo dimpled indentation and shadow, creating an enigmatic inner smile. That signature detail is missing on the right corner. The left hand as we look at the painting (the raised hand) is much better rendered than the other hand. We see and feel the anatomical detail of the raised hand, but not the other. The orb on the apprentice’s side of the painting is not detailed at all. It looks unfinished. The drapery is much more nuanced and advanced on the raised hand side of the canvas, where it falls naturally and looks photographic. On the orb side it is stiff and forced. Again, it is my theory that Leonardo used this uncompromisingly full frontal pose to draw a line straight down the middle of the canvas and paint one side of it himself (the raised hand side) while instructing an apprentice to copy his work on the shaded side. The only exception is that I believe the apprentice was instructed to do all the intricately detailed ribbon and jewel and front fabric panel work. It looks to me like Leonardo painted the entire raised hand and arm including the drapery as well as that side of the head and face, while the apprentice did his best to finish the other side. 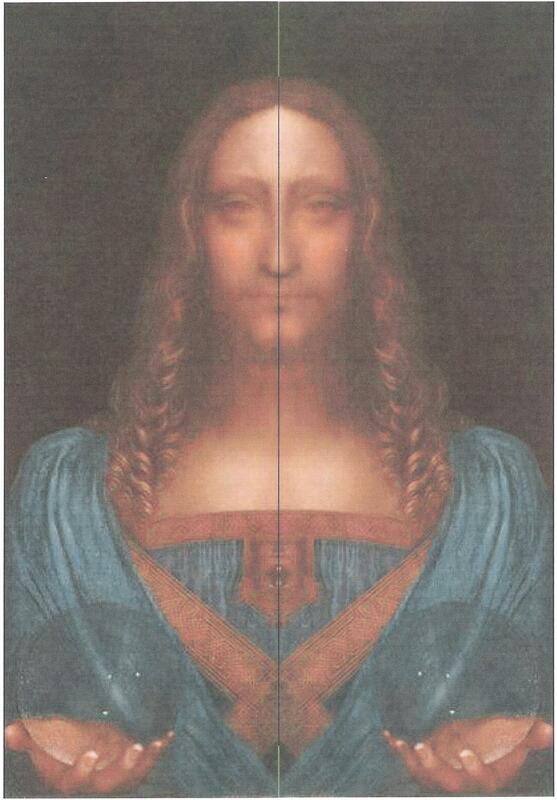 This is the Leonardo half of “Salvator Mundi” paired with its own mirror image. To my eye this is clearly a Leonardo painting in every respect – the confident and focused gaze looking directly into the viewer’s eyes, the organic eyes and eyebrows, the refined nose, the mysteriously half-smiling mouth, the hair, the anatomy of the hands. All of it is quintessential Leonardo, and the result is a powerful, commanding, confident image of Christ. 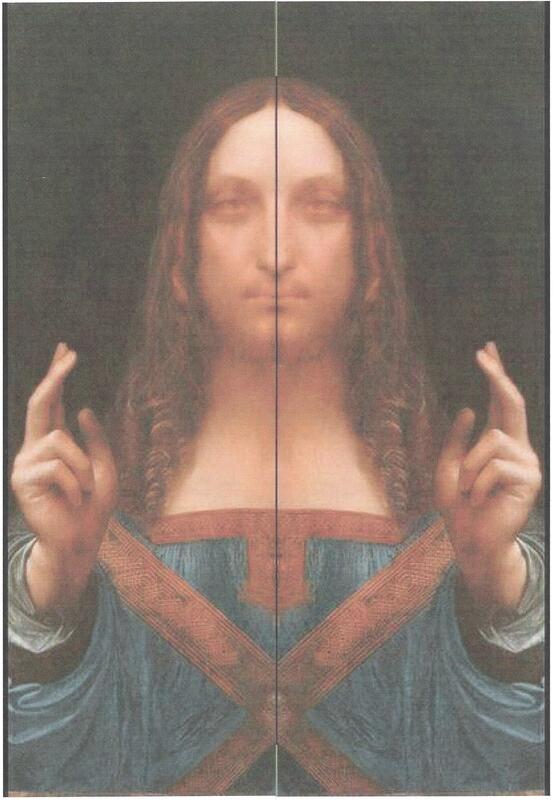 By stark contrast, here is the apprentice’s half of “Salvator Mundi” paired with its own mirror image. The eyes, eyebrows, nose, and mouth, while compelling, do not look like Leonardo’s work. Moreover, the combined effect depicts a thin, weak, worried face with a flat nose and pursed thin lips. Leonardo’s faces are almost always sublimely serene with full sensuous lips, dimpled in the corners to provide that signature enigmatic inner Mona Lisa smile. That trademark characteristic of all Leonardo faces is entirely missing in this mirrored pairing of the apprentice’s side of the painting. While we can clearly see that this side of the painting is heavily influenced by Leonardo, it is not the master’s work, even though some may prefer it to the more robust and serene Christ image entirely by Leonardo. According to www.italian-renaissance-art.com/Salvator-Mundi.html, there are 20 versions of “Salvator Mundi.” It is evident that 19 of them are copies of this painting produced in Leonardo’s studio, because infrared imaging has shown several “pentimenti (artist’s alterations) in Leonardo’s painting. Those final changes are mimicked in the 19 copies, but, of course, infrared imaging shows no changes in their painting process. The Leonardo image is composed of pigments characteristic of his work, and it is painted on a walnut panel that was produced in the correct era, consistent with other Leonardo paintings. His depiction of a crystal “mundus” is a unique innovation that also links the painting to the master, because he was something of a rock crystal expert. There is strong documentary evidence that in 1506 Louis XII of France commissioned Leonardo to produce a painting entitled “Salvator Mundi,” which was completed in 1513. The work is documented to have been in the collection of King Charles I in 1649 and sold at auction by the Duke of Buckingham’s son in 1763. The painting fell upon hard times after that, and was lost until 1900, when it was purchased by the British art dealer Sir Frederick Cook. Several very poor restoration attempts made the painting very difficult to authenticate, and it was sold at auction for about $125 in 1958. In 2005 it was acquired by a consortium of U.S. art dealers and properly restored. 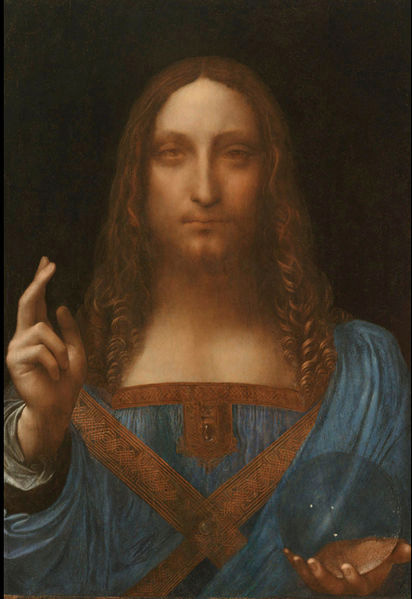 After a seven-year authentication process, “Salvator Mundi” is now generally believed to be a Leonardo da Vinci painting worth somewhere in the neighborhood of $100 to 200 million. For its recent exhibition, The National Gallery in London cataloged the painting as a newly discovered Leonardo. This entry was posted in Art, Spirit, Uncategorized and tagged "Salvator Mundi", Art, art history, Leonardo da Vinci, The Lost Leonardo by paulmichaell. Bookmark the permalink. Wow, some food for thought here. I’ve only seen the painting in reproduction (unfortunately), but since I first clapped eyes on it I’ve found it strangely troubling. I’ve never quite got around to thinking about why, so thanks for the push. Glenniebee, thanks for your quick and encouraging comment. Like you, I was troubled and fascinated by “Salvator Mundi” and couldn’t help thinking about it and seeking information about the haunting painting, even though I have not had the opportunity to see the actual work. Studying many different photographs of the painting and reading lots of articles just added fuel to the fire of my questions about the painting. It was only that moment of concentrated meditative reverie that satisfied me, when it seemed like I was transported back to Leonardo’s studio, and felt as if I could “see” the great master using this commission as a way to train one of his apprentices. I appreciate your kind support of my efforts to add some small bit of value to the debate around this great, mysterious and “strangely troubling” masterpiece. What a great analysis Kevin! Being an interpreter for the deaf, I tend to be sensitive to facial expressions and body language and have to admit to being very perplexed in a troubled way especially when looking at the eyes and mouth in this painting. Until you broke it down and created the mirror image versions I couldn’t figure out why I was so bothered. I see that it’s because my mind was taking in the whole and shifting back and forth between questions… “Is he confident and sure? Yes… no… ” “Is he timid and uncertain? Yes… no…” It was like trying to say the words “confident” and “timid” at the same time and coming up with “confimid” and expecting to understand what that means! Thanks for the insight and visuals! Although I am not a painter, nor do I have the knowledge of the masters as you do, I thoroughly enjoyed reading this! An amaing read and analysis! Thank you Kevin! Unless you take into account the high level of damage and repaint on the right proper side of Christ’s face (not least his right eye) and the large amount of restoration it is unsafe to undertake this kind of analysis. I just saw the BBC documentary regarding this picture, and Im as intrigued by your analysis, as I am by the painting itself. unfortunately I have little faith in an American consortium of investors who say ‘We found a lost Leonardo, yours for 200 million” and their lack of evidence regarding the techniques used to restore it is troubling, although Im sure will be forthcoming. The black and white image they released for the pre-restoration work looks almost like a different picture though. Its a peculiar and striking image. An image attributed to an older Leonardo, and the thought crossed my mind, and mostly because I want it to be a true Leonardo (I saw it at the National in the flesh, which is where the thought struck me) that perhaps the lopsided quality of the work, from left to right could be a masterful, even satirical, commentary on the perfection of the spiritual world, and the rough hewn nature of the mortal earth. This deliberate way of unsettling or unnerving the viewer is also a mark of Leonardo, usually through unusual composition though, but just maybe, faced with a commission for an entirely traditional composition, he subverted it thus. That was my hopeful argument to my girlfriend (who is the art expert of the two of us) who just plain thought it was ALL wrong. The problem I have with that idea though, is I find it hard to believe the great artist would allow a hand like the one holding the orb to be attributed to him, or his school, because it truly is dreadful. The Orb appears to have no weight, the hand is in an unnatural and awkward position, completely unlike anything I have seen before attributed to Leonardo, more like something painted 50 years previous, and not at all positioned by a painter with a peerless knoledge of anatomy. The contrast in detail and skill with the opposite hand is stark. I certainly wouldnt be bidding for this picture with its current provenance and authentication. The people involved, including the National Gallery just have too much to gain in my opinion, in a multitude of ways, for it to be 100%. I will have to reserve my final opinion of course until we find out what this ‘consortium’ did to it to bring it to its current state. Im hoping we dont see that the original paint was taken down to the last micron before being retouched, and from what Ive heard so far the picture has been mauled and brutalised on more than one occasion in the intervening five centuries. I agree with much of what you have written. Since posting my own analysis and images regarding Salvator Mundi, doubts about its authenticity continue to haunt me. Like you, I want it to be a real Leonardo, and what keeps me hanging on is the sublime benediction hand which seems like it could only have come from the master himself, and which appears to be largely untouched during all the overpainting and brutalization of the work through the centuries. I quite agree with you that the recently released black and white photo is so heavily overpainted that it does not look like the same work at all. But that hand is still there, offering celestial benediction and bidding me to have faith in the creator. Nevertheless, as a natural skeptic and doubting Thomas, I have come to understand how very lucrative the high-rolling art market is at these lofty levels of top flight art dealers (in consortium or alone) and world-famous art experts and restoration artists. As you point out, there is so much to gain. I hope motivations in this case are more than monetary, but one can only imagine that, especially after this episode, there must be a mad search for centuries old canvases in very bad shape, with cloudy provenance, that could conceivably have come from the studio of one master or another. Then it would be just a matter of “restoring” such a painting in secret, without releasing process photos, and voila!… a beautiful masterpiece that can be authenticated by experts and sold for millions or hundreds of millions. It would be a long, painstaking, tedious process, but well worth it for the right reward, even split 20 ways. The Salvator Mundi consortium and restoration experts could clear up my skepticism and doubt by releasing an extensive series of photos of the restoration process along with a step-by-step explanation and concommitant developmental thinking by authentication experts. This is what happens in the world of science, and it should happen in the art world as well, especially in the case of such an important historic masterpiece. Scientific journals require full transparency of theories and proof processes so that they can even be replicated in other laboratories. Since many doubters like you and me probably hope that this painting is real, it would seem to be all to the consortium’s benefit to release full documentation of the restoration process. Until then we must doubt. However, I continue to believe in the strong possibility of my hypothesis that Leonardo used this full-face commission as a training tool for one of his apprentices, possibly Giovanni Antonio Boltraffio. In the final restoration, the two halves of the painting look so much like the work of the master (on the benediction side) and an apprentice (on the orb side) that the hypothesis I have outlined seems evident and obvious. However, I cannot feel absolutely certain of my hypothesis, I must confess, until all of us are permitted to see photos of the painting as it looked after all overpainting was removed, but before any restoration work. That is the image I am waiting to see. The recently released black and white image of Salvator Mundi with centuries of overpainting still caked on top of the original work, is opaque — like a human face behind a glazed wooden mask. It tells us nothing, except that very extensive restoration was done. We already knew that, and it only reinforces our skepticism. Let the “consortium” show us the painting with all overpainting removed, before additive restoration began, and then we will all be able to make up our own minds. Finally, you raise a question that I have often posed to myself: Why would the master allow any painting to be relased from his studio with such major elements as the orb and the hand holding it painted in such an inferior and immature fashion? I can only guess that perhaps it was understood by the buyer that Leonardo had painted the benediction side and his apprentice the orb side of the painting. I agree with you that Leonardo would not have wanted his patron or others to think that the orb and the hand holding it, not to mention that side of the face itself, were painted by him. He would have made it public knowledge that Boltraffio or another apprentice had painted those elements, all of which are clearly inferior to the master’s side of the painting. While I am intrigued by your theory that Leonardo himself might have deliberately painted the two sides of the work with obviously diverging expertise to provide an analogy for the duality of Heaven and Earth, I think it more likely that he used the commission as a teaching tool for an immature apprentice. However, you have clearly done some solid creative thinking and analysis about Salvator Mundi, and I salute you for it. Utterly convincing. Though I did not notice the hands or mouth issues, I did notice the eye, and the strange vertical division and contrast between the two sides, but couldn’t think of a scenario that would explain why the right half was defective. I even tried the same trick of doubling the sides! But I suspect that you’ve nailed it. Bravo. There are simply too many errors in both sides of the painting. The hand of benediction is the most convincing part of this work. That is, it appears to be most similar to Leonardo’s technique. However, it seems completely separate from the body. It’s angle, position, distance and relation to the body as a whole is anatomically incorrect. Even though Leonardo often altered anatomical features (slightly), he never painted anatomical relationships incorrectly. It is fairly easy to duplicate his hair effects – any assistant could do that. Even though this painting has been poorly treated, there is none of Leonardo’s trademark clarity in depicting facial features. It is odd that the entire face has been uniformly smudged while the blessing hand has somehow survived unscathed. The National Gallery seems to have had quite an argument about it, too. So, all curators and staff do not agree on its authenticity – even though they all examined the same evidence. This seems to indicate that the evidence is not empirical, just convincing. So, far the people arguing in favor of it all have something to gain. This, too is not a good sign. Patrick Harris, I agree with most of your comments regarding Salvator Mundi, although I am not bothered by what you identify as anatomical disorientation of the benediction hand from the body. In addition, I feel that the corner of the mouth on that benediction side of the face bears Leonardo’s trademark enigmatic smile dimpling. However, I certainly agree that the entire face is virtually shrouded in darkness and almost dry-brushed out of existence, as compared with Leonardo’s usual crisp clarity of definition. As you note, the benediction hand is the most convincing part of the work. Much of the rest is troubling, although I continue to feel that the benediction side of the face looks much more like Leonardo’s work than the other side, which I hypothesize must have been painted by an apprentice. And, yes, it is certainly noteworthy that the people arguing in favor of complete authenticity have something to gain. I wonder what you think now that the restored version is being shown. I tend to agree with you, Patrick. Viewing the photograph of the restored painting (before finding this article) I also was disturbed by the hand giving the blessing. I don’t know if you’ve seen the restored version, but it seems completely out of place with the face and body. It strikes me as Mannerist, as if the hand is coming out of the frame in a 3-D movie. The hand is beautifully rendered, but the lighting on it is so stark that I just cannot imagine it is Leonardo’s work. I am particularly interested in Leonardo’s possible use of the camera obscura and optical equipment, and I simply cannot believe he painted the orb. This might dovetail with Kevin’s thesis, but a solid glass or crystal, or even a blown glass orb would distort the robe behind it far more than this one does. The portion of the hand showing through the orb is just lazy painting. The idea of Leonardo painting a glass or crystal orb is fascinating, but I cannot accept that it would have come out like this. I would also like to mention that, again, before finding this page, I held my hand up vertically to separate the two sides for much the same reason the Kevin discusses–the corner of the mouth, mainly. I do find Kevin’s argument persuasive, but I would agree with you that the master did not paint the right hand, either. I saw this painting in Dallas and found it intriguing that the walnut panel has a large knot which is actually deforming the surface where the brown fabric panels cross. Would a master have painted on such a flawed board? I also don’t believe that rock crystals magnify, and the palm of the hand holding the orb is clearly magnified. It has also been pointed out to me that the hand giving the benediction does not appear to have a shoulder or upper arm connected to it. Furthermore the first joint of fingers four and five are precisely the same length, an anatomical error that I can’t imagine Leonardo making. Interesting therory with the two different painters. It is probably true, to a limit. try to paint the other half without getting anny trace of it at the line. Even if the SAME artist would do it. You just can’t blend the right colour again. It’s every artists nightmair to have to make adjustments in such areas of a painting. One usualy have to repaint the whole area. In this case the whole face. halffinished face but I don’t think “cut in half”. It would allso appear on the exary. About some of the other coments. It’s in our days we would not like to let a “les good painting” leave the studio. After all, it’s not signed. They didn’t even bother to sign most art then. craftmanship than the “Fine Art” we have invented today.